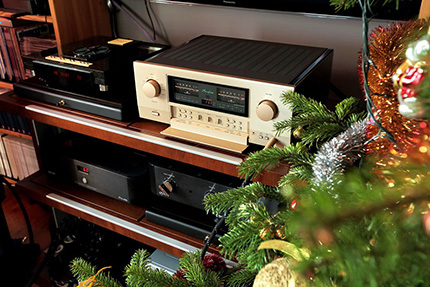 The E-600 is the follower to Accuphase’s flagship integrated amplifier, the successful E-560. The manufacturer decided to change the name from E-five-hundred to ‘600’ to mark the amazing progress they managed to achieve. The new naming scheme is to symbolize a change that is something more than just releasing a new model. That much we learn from the company literature. It would be needless to repeat that the change of its flagship integrated is really SOMETHING for Accuphase. Usually it is the most expensive, most advanced products that “haul” the rest of high end manufacturer’s lineup around. The A-200 “anniversary” monoblocks reviewed by me some time ago, and before that the two-piece DP-900/DC-901 SACD player, confirmed Accuphase capabilities as a manufacturer, at the same time ushering in a new sonic direction (the review appeared in “Audio” magazine). That is at least how I understand it: a direction for sonic fullness and density. But let’s get back to the integrated amplifier. Apart from its flagship design, Accuphase has always devoted most of time and energy to its most expensive integrated amplifiers. Although they lack the advantages of two-piece designs, they promise something the latter can’t: they do not require extra cables or space. For many music lovers both of them are as important as the sound itself. I vividly remember auditioning the E-600’s predecessor, the E-560. It did not have an easy life. It replaced the well-received E-550 without actually offering too many improvements, at least on paper. Both were quoted as having power output of 30 Watts into 8 Ohms, which increased to 120 Watts into 2-ohm load. They had similar distortion and dynamics characteristics. The E-560 output signal-to-noise ratio was a hair lower (-116 dB vs. -120 dB). The differences in outward appearance were even smaller. Those that could be seen were mostly cosmetic, hidden under the sliding flap on the front panel. To understand what you get with the E-600, you need to know what was “under the hood” of both its predecessors as well as to know the context of these changes. When I opened up the E-560, my first thought was about “streamlining” of the starting design. The E-560 turned out to be assembled almost entirely in surface mount technology, while previously it was predominantly traditional through hole assembly. For many manufacturers, the transition from the latter to the former reflects a technological leap. It is not always positively associated in the audio world, due to the higher noise and distortion of SMD components as well as their inferior thermal properties. The way I see it, Accuphase simply had to take a firm step in either direction. The arrival of the E-560 coincided with a sharp drop in Japan’s exports and was actually forced by it. The high cost of raw materials, which the country is largely importing, combined with the Yen’s high exchange rate hurting overseas sales resulted in such increase of the production cost of electronic devices, including E-550, that you needed to think really hard in order not to run a business at a loss, and forget about making a profit. In this situation, the only good option seemed to be an escape forward to newer models, featuring an improved design and significantly higher price. This is how the E-560 came to be. I listened to it and although it had certain advantages over its predecessor, the overall change was not enough to justify the upgrade. That is, unless we found the E-550 irritating in the areas that were improved in its successor, including tighter bass, better resolution and dynamics. Then the upgrade to the newer model made sense. Let me repeat, though, that for me it was not a step forward as much as a step sideways. The E-600 is a completely different story. Do you remember the comparison of the Accuphase E-250 and E-260 integrated amplifiers in the last year’s February issue of “High Fidelity” (No. 106, February 2013)? If the E-550 were the starting point, the E-600 would be one more step further from it than the E-260 was from the E-250. The most visible is the change of power output meters referred to earlier. In my opinion, it is for the worse, but I talked to a few people who had previously owned the E-550 and E-560 and found this forgivable and even desirable. On the plus side is an alphanumeric LED display indicating volume level and significantly improving unit’s ease of control. The amplifier is visibly higher, slightly deeper and heavier. Much more important, however, are the circuit improvements resulting in further noise and distortion reduction, and significantly higher damping factor. Although manufacturer-quoted specifications rarely translate into the sound, at least not directly, in the case of Accuphase (as well as Soulution) the two are closely linked. Apart from improving measurable characteristics and changing the indicators, an important addition is the new optional DAC-40 D/A converter board. Inserted in one of the two installation slots on the rear panel, it allows to connect digital sources via coaxial, optical and USB connectors. The latter operates in asynchronous mode and accepts signal up to 24-bit and 192 kHz (unfortunately, it is not DSD capable), just like the RCA coaxial input. The TOSLINK input can be fed with digital signal up to 96 kHz. 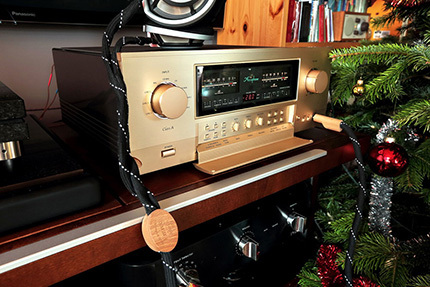 Class A amplifiers are the jewel in Accuphase’s crown. They constitute the core of its lineup, even if the models operating in the more efficient Class AB are simply more numerous. This way Accuphase implements the commendable objectives set before the designers of this type of amplifiers: to operate in the most linear portion of the characteristic curve and to avoid the problem of crossover distortion resulting from the signal crossing over the zero point. Crossover distortion can be alleviated to some degree, as demonstrated by Cambridge Audio in the so-called “Class XD”, featuring crossover displacement where the usual crossover point no longer occurs at zero volume but at a significant output level. Even in this case, however, it is still Class AB, with certain characteristics corrected. Class A is the basis of SET (single-ended triode) tube amplifiers, where the output stage operates in single-ended mode, i.e. the signal is handled by a single (or in several parallel) active component. Single-ended mode is also used in solid stat amplifiers from First Watt, Tellurium Q and Constellation Audio. These are, however, rare exceptions. What needs to be taken into account is that they either have a very low power output, only slightly increasing in dynamic conditions, or run a very high price tag, which makes the cost of Accuphase amplifiers seem negligible. If you have read my review of the Iridium 20 amplifier from Tellurium Q, you know my view on the usual stereotype associated with Class A. In my opinion, it is so confusing that its evaluative value disappears. It seems that closer to the truth is what is represented by the Accuphase A-60 and A-65 monoblocks. It’s a very fast and clean sound with powerful dynamics. This would find confirmation in auditions of the best tube amplifier I know, Jarek Waszczyszyn’s Silver Grand Mono monoblocks. The above mentioned amplifiers as well as the E-550 and E-560 integrateds all seemed to lack something I only heard with the powerful A-200 monoblocks. It was fullness and some sort of warmth. The E-600 does not sound stereotypically “warm”. The general rule is, however, that after reducing distortion to a certain level the sound settles down, becomes deeper and seems darker – hence the impression of warmth. That’s exactly what I heard from the amplifier under review. Instead of flooding the sound with a homogeneous mass, the Japanese amplifier offered an outstanding resolution. Accuphase’s hallmark, i.e. a slight hardening of the attack and the resulting contouring of sound was also present, but there was something more to it. The attack was followed by full-bodied sustain and very nice release. This gave a complete, satisfying sound which was, on the one hand, saturated with details and, on the other, coherent, in the sense that it didn’t actually need detail to convince about its value. The A-200 had gone even further and the best tube amps are also capable of delving even deeper into the sound. As far as solid state integrated amplifiers go, I’ve heard something similar, and in some respects even slightly better, only once with the Soulution 530, costing three times more. However, the amplifier under review offers such a complete and all-round finished sound that the differences are minor. With 30 Watts per channel under the hood there is not much ground to expect stratospheric volume levels. This is basic physics and there is no way around it for now. However, the fact that the output power doubles at half the impedance load and then doubles again down to 2 Ohm, and even 1-Ohm operation is possible (although the latter with music signal only, not a continuous sine wave), tells us that this is a powerful tool. Those who have heard the Soulution 710 power amp at my place and seen its massive body, usually remark casually that it’s probably 500, or even 1000 Watts. Actually, it is “only” 125 Watts per channel. Except that it doubles at a lower load impedance. I hear exactly the same thing with the E-600: its dynamics seem unlimited. Children of Sanchez, the track famous for its dynamic range, sounded exceptionally open, fast and agile. While on the E-560 the price for it was a shallower midrange, its successor sounded the same across the whole range. Its sound was full and selective at the same time, no matter if it played quiet or loud. It was only when I pushed it really hard with Anja Garbarek and Massive Attack tracks that I heard the limits of what it’s capable of. It’s about the depth of bass. The amplifier had a low, full sound with great control over the whole range and without even a moment’s hesitation. However, there was a point when the lowest bass became slightly withdrawn. It might have perhaps extended even deeper yet there wouldn’t be – so I imagine – the kind of smoothness and coherence it offered now. Once I knew what to look for, I was also able to pinpoint the moment when Haden’s double bass started to sound slightly lighter on the E-600. That was stretching it, though, and would be difficult to confirm without this kind of push. Vangelis on Blade Runner, which has rather substantial “weight”, did not betray any specific departure from what I heard on the reference system. With all the other albums, even on such large speakers as the Harbeth M40.1 it will be hard to say that the E-600 does NOT show something. Not because it’s a perfect sound but because it is so well “made”. It is possible to enumerate its characteristic features and point out which are shared with the E-600 predecessors. It’s just that everything here is combined in a new way. A strong midrange and treble attack now shows as fast rise transients without any blurring, followed by full sound of considerable weight. A contoured bass now translates into full control over the speakers. On the other hand, a slight detachment from the musical material that used to be characteristic for Accuphase has now completely disappeared. The E-600 builds the soundstage in a different way to what I have been used to over the years, listening to components from Yokohama. The foreground is now shown close up, almost directly in front of the listener. The soundstage is deep, with very decent holography, but it is what’s happening right in front of us that bolts us to the chair/couch. It makes sound density and maturity – in the sense of its fullness – truly unique. Let me put it this way – even the A-200, an outstanding amplifier, did not do it in such a convincing way. We pay for it with a slightly smaller reverb and diminished acoustics of further planes. What we gain, however, is sonic tangibility which lets more “experience” or maturity in the sound. The included DAC does not look as attractive at first glance. The number of “gears” in the MDS++ circuit is limited and the D/A converter is an older design, not the recent ESS Sabre chip. The whole board is actually rather small. It would be a mistake, however, to treat the DAC as a whim or less significant addition intended for BD players and digital TV tuners. A comparison with the reference player showed the lower resolution, saturation and smaller soundstage of the DAC-40. But I was prepared for it. What was new for me was how long it took to compare the two against each other, to know exactly what’s going on. The tonality of the optional Accuphase DAC was slightly darker than that of my Lektor AIR, lacking some treble of the latter. But that’s probably intentional. With all its velvety and rich sound, the E-600 does not fully “accept”, if I may say so, poorer produced tracks. If treble is slightly overly-contoured and vocals are audibly compressed, as on the latest (really beautiful) album by Martyna Jakubowicz with covers of Joni Mitchell songs, the result is the hardening of top end attack. The DAC-40 smoothes out and darkens this exact sonic component. Hence, the E-600 + DAC-40 combo offers an even smoother and more pleasant sound. In my opinion, its quality matches that of the DP-410 player from the same manufacturer, given, of course, that we pair the latter with a top notch CD transport. And that means that we’re talking here about an outstanding “option” that allows to save a lot of money. While more expensive components will provide a wider soundstage and better sense of intimacy with the “body”, the DAC-40 does that with such grace that I can easily imagine people who will sacrifice that for convenience and in order to save money. Attention: the USB input sounds just as good! The sound may lack some of the precise image outlining of the CD, but is saturated and smooth. While the DAC-40 is more than a mere “add-on”, the headphone output should be treated that way. I’m sure that Accuphase engineers were extremely serious about the included headphone amplifier. However, they weren’t able to come up with something that would be a match for dedicated headphone amplifiers from one of the specialist manufacturers. Resolution, selectivity and smoothness – they are all here. What’ lacking, though, is a full-bodied sound that can be heard through the speakers, and the bass is quite light. 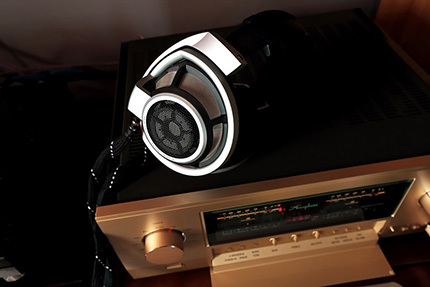 If all you want is to use your headphones only occasionally – and the Accuphase headphone output will be just great for that – you will be better off with those that have a saturated bass, such as something from AKG or Beyerdynamik. Sennheisers and HiFiMANs were not anchored enough in the bottom end. Two-piece audio systems have a solid engineering basis. Separating preamplifier and power amplifier power supplies, and their mechanical separation bring certain benefits. Naturally, the downside is the need for additional cables, which is quite expensive – I assume here that we care about the best possible sound, and not a simple coupling of the two components. The problem of such systems is, however, the preamplifier, which is almost always the weakest link. If I were to set up such a system consisting of products from of any manufacturer, I would spend twice as much on the preamp as on the power amp. That is reality, unfortunately. The E-600 presents us with the kind of scenario I could come up with: there is no trace of veiling of the sound that is characteristic of budget preamps, and the resolution and fulfillment are outstanding. So is dynamics. To clearly beat it, I would need to pit it against the top Accuphase C-3800 preamp paired with the A-65 power amp. Even then the sound would not be so smooth and rich, and only bringing to the table the A-200 monoblocks would turn this comparison into a joke. The E-600 is not simply better than the E-560; it takes the game up to another level, and to compare the two would not be fair for the older integrated. The E-560 and E-550 were very successful amplifiers that I respected, but they just didn’t do it for me. The E-600 is a really great amp; not the best one you can buy but good enough to not think obsessively about getting an expensive two-piece system. The only thing that requires some attention is the treble, especially if you often listen to normally produced albums, where “normally” unfortunately means lots of compression and lack of concern for sub-range coherence. There will never be too much treble but it can have slightly contoured character and strong attack. All other, better produced CDs will sound velvety and dense. Simply because it is an outstanding amplifier. Accuphase has been very slow to change its amplifiers’ enclosure design. Many of the design solutions introduced in the early models can also be found in the latest units. The distinguishing feature of this manufacturer is the front panel made of golden anodized aluminum. Although in its history there have been silver and even black units, it is gold finish that has survived the test of time and is associated with Accuphase. The front panel has changed only slightly from the predecessors. It features a large acrylic plate in the center, with volume level indicators and LEDs behind it to signal the status of various circuits, such as the absolute phase, the mono mode, one or the other speaker output and any of the three digital inputs (with the optional DAC board installed). In place of VU-meters, used for example in the A-60 and A-65 power amplifiers, Accuphase now uses LED indicators. The volume level is indicated via an orange LED display, which also (briefly) shows the sampling frequency of digital input signal. The left knob is the input selector and the right one controls the volume. The volume knob is coupled with a complex, precision-made, very heavy mechanism to give the knob desired inertia and precision. Previously found in the top Accuphase preamplifiers, it is now used in the newest integrated. Under a hinged flap there is tone control and other less frequently used buttons. The E-600 can be fed both unbalanced and balanced analog signal. The latter is handled by two line inputs, pre out and power in. This is the first integrated amplifier from Accuphase to feature a fully balanced signal path topology, from start to finish. Previously, only the preamplifier section was balanced. We have at our disposal eight analog inputs (6 RCAs + 2 XLRs), one of which includes tape monitor (unbalanced), two power ins and two power outs. If that’s not enough, you can add more line inputs with an option board. Other option boards include a phono stage and DAC. The interior of the components from this Japanese manufacturer has not changed for years: it features metal screens that reinforce the entire enclosure and separate the individual modules from each other. I’ve seen the solution copied dozens of times by Chinese manufacturers. However, each time I was sure that what I saw was just a copy, a fake that may have been a tribute to the original but would never be even close to it. The differences were usually in details like the type of finish, the inferior components used and assembly arrangement, and the overall lack harmony. However, they were the reason not to treat it as a development but only as an attempt, not always successful, to copy the original. The E-600 continues this type of design. In the center we see a very large transformer in a shielding enclosure filled with vibration damping material. Adjacent to it are two massive capacitors to filter voltage to power amplifier circuits. The latter are mounted directly to solid die cast heat sinks. The input circuits with selectors and connectors are mounted at the rear, while the AAVA volume control unit is housed at the front. The right side sports an empty area additionally shielded off with MU-metal to house the inserted option boards. Since the latter include the phone stage or DAC units, their proper shielding from the other components is essential. The preamplifier is mounted on three PCBs, separate for RCA inputs, XLR inputs and volume control assembly. The latter is the newest version of the Accuphase proprietary AAVA circuit, originally developed for the flagship C-3800 preamplifier. The AAVA volume control includes V/I converter, CPU volume attenuator and I/V converter. It is fully analog (AAVA stands for Accuphase Analog Vari-gain Amplifier) and has been developed by the manufacturer for several years. All preamplifier sections are built on integrated circuits. Power amplifier boards are different than those in previous Accuphase integrated amplifiers and look to have been redesigned. They are assembled in mixed technology, featuring both through hole and SMD components, with discreet transistor gain stage. The only IC can be seen in the current feedback circuit. The amplifier features instrumentation amplifier and MCS+ ((Multiple Circuit Summing) topology for truly balanced signal transmission. The output stage sports the Toshiba J618 + K3497 MOS-FETs in triple parallel configuration operating in pure Class A. The DAC-40 is an option board to be inserted in one of the two available slots on the rear panel that are identified in the input selector as OP 1 and OP 2. It is housed on a single PCB. 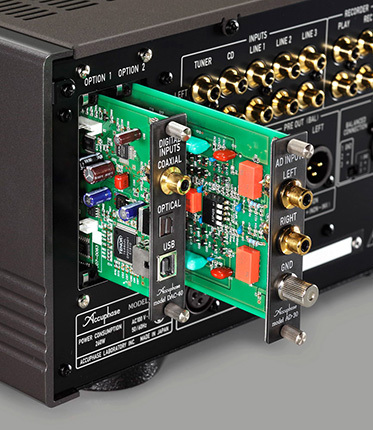 The S/PDIF inputs sport the AKM AK4118 digital receiver, and the USB input is built on the Tenor TE8802L USB receiver and converter – a great chip, used for example in the earlier SACD players from Marantz. From the currently selected input the signal goes to two Burr-Brown PCM1796 DACs, operating in dual-mono. I/U conversion and analog filtering and amplification is handled by the JRC4580 op amps. 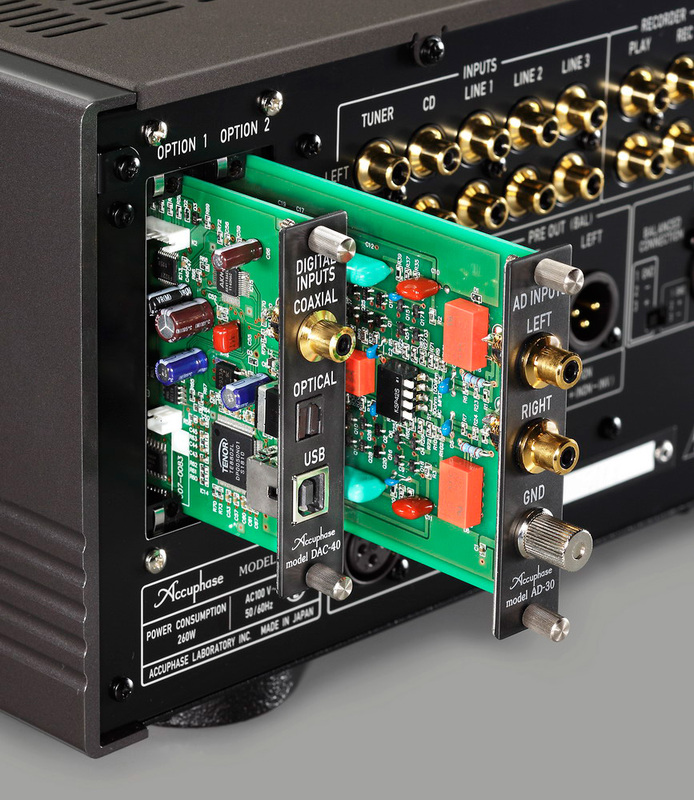 The signal is processed in two parallel paths (per channel), to implement Accuphase proprietary MDS++ technology. All active components and resistors and some capacitors are assembled in surface mount technology. Only the capacitors in the signal path are polypropylene and electrolytic through hole units. The back of the board is fully shielded with a steel plate that also stiffens it. A solid piece of work.